HHSA protective services worker and children's author Shari Tharp. At some point in your childhood, you were probably introduced to adventurous tandems like Jack and Jill, Frog and Toad or Hansel and Gretel through stories your parents told you before bedtime. Shari Tharp, an HHSA protective services worker, is hoping today’s generation of kids will be able to add Gertrude and Toby to the list of duos they follow from one literary adventure to another. Gertrude the goat and a Toby the tortoise are the central characters in a series of children’s book authored by Tharp. “Gertrude and Toby’s Friday Adventure” recently won a silver award as best illustrated e-book from the Independent Publisher Book Awards. The next two in the series – “Gertrude and Toby Meet the Wolf” and “Gertrude and Toby Save the Gingerbread Man” will both be out before end of the year. Tharp came up with the idea for the book series when her young son insisted she read him a story before bed late one night. She decided it would be quicker to just tell him a story. He had been asking for a pet goat – which wasn’t going to happen, according to Tharp – so she made the story about a goat who befriended a tortoise on a farm. The second night he asked for more, so she decided to have them head out on an adventure. By the third night, she had them talking. At first, she had just thought she would find a way to self-publish the book for her son and family members, but her husband is a professional editor and he thought she should submit the story to publishers and agents. The book is dotted with familiar fairy tale characters. Gertrude and Toby encounter a little girl in a red cape, an evil woman with poison apples, a crown-wearing frog waiting for a magical kiss and a gingerbread man. But she had to rewrite the end of the book. She was told you don’t have cliffhangers in children’s books. Kids want “happily ever after” and an ending. So instead of the gingerbread man getting caught in a vine grown from magic beans, Gertrude and Toby decide it’s getting late and they should head home and end their first adventure before the farmer returns. She also maintains a hectic work schedule. “It’s been tough. I have a heavy case load and in the evening I just want to go home and relax and watch TV. But there are a couple of nights a week I will write and then again on weekends,” she said. Besides writing, there are writers groups, book signings and author visits. She had a signing at Warwick’s in La Jolla and has done several author visits to local elementary classrooms. She’s also been busy writing more children’s stories. Next up is Granny Franny, a frog that babysits her little grandchildren frogs and tells them exaggerated stories of her life. She also likes to break a few rules. The Gertrude and Toby stories are aimed at children ages 6-9, and Granny Franny will be for children ages 5-7. “When I think about a story idea, I’ll grab my phone and start talking and recording the idea,” Tharp said. “I thought I should just write all these stories as they come because at some point the ideas won’t come anymore and I’ll have writer’s block. “Gertrude and Toby’s Friday Adventure” is available in soft cover, hard cover or e-book form and can be found on Amazon, Barnes & Noble or Walmart websites. 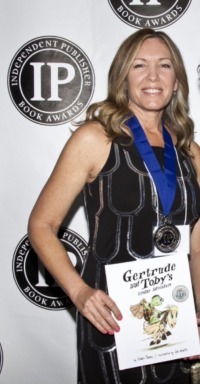 The cover of "Gertrude and Toby's Friday Adventure" and the Independent Publisher's silver award.